The Equitonic 9 is a device that dispenses safe, ultra-low sound wave frequencies that penetrate the deepest layers of the body’s tissues to dissolve cellular trauma and speed up the natural healing process. Looking for a Safe, Natural Solution to Inflammation, Muscle Damage, and Joint Discomfort? Very simply-- the Equitonic 9 WORKS! Anybody can make a claim. But can they back it up with scientific research? The Equitonic technology has double-blind, controlled studies to prove its results! Controlled research with groups of Standardbred horses has shown that the Equitonic 9’s Infratonic signals reduce inflammation, as indicated by infrared thermography. It accelerates muscle cell healing, measured by the diagnostic muscle enzymes CPK and AST in serum, and increases hyaluronic acid production. What If I Want To Help My Horse's Joints Regain Their Synovial Fluid? Equitonic 9 offers real, and natural help to horses suffering with joint discomfort! Our additional research has shown not only a 41% net increase in hyaluronic acid but also an increase in volume, viscosity, and clarity of synovial fluid. You can find our scientific research on our web page. What Exactly Is The Equitonic 9? The Equitonic 9 is a hand-held, rechargeable, battery-operated, patented chaotic sound wave device that has been on the market for over 25 years with a 100% safety track record. Richard Lee invented the Equitonic 9 after many requests to make an equine unit that was as effective as the human-designed Infratonic 9. Is it True that the Equitonic 9 Saved a Horse from a Flesh-Eating Bacteria? The Equitonic 9 Requires ZERO Special Training to Use! Unlike other devices on the market that are heavy and bulky and require hours of special training to use, the Equitonic 9 can easily be carried in a pocket to be pulled out for ease of use, and there is no time expenditure to learn how to operate it! An hour and a half charge will give the user at least 50 hours of use, which makes the device very easy to travel with. And it is 100% safe. We are a small company, always available to educate you on different ways to use the device. 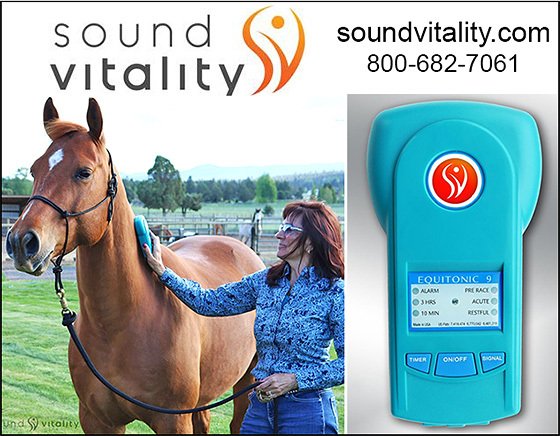 The Equitonic 9 Has Saved Many Horse Owners Thousands of Dollars! What if I Have a Horse That is Stressed, Upset, or Anxious? The Equitonic 9 can help! It produces sound waves in the alpha-range, the range most often associated with the calming effects of meditation and relaxation. It promotes a sense of peace and well-being in horses… and, for the record, in humans, too. When treating stress or anxiety, just select the Restful setting and point the device towards the chest. How Soon Should I Start Using the Equitonic 9 When Experiencing Discomfort, Injury, or Stress? The sooner it is placed on the insult or injury, the sooner one will see results. The Equitonic 9 has the capability to successfully address issues related to the hooves, joints, muscles, digestion, eyes, nervous system, or really any issue that involves inflammation or discomfort. How Often Should I Use the Equitonic 9? While the Equitonic 9 is completely safe, most of our users report the greatest success when using twenty minutes, three times a day for a few days. Every situation is a little different… for some horses (and people), a five-minute treatment can bring visible results, depending on the issue. Is There Any Time it is NOT Safe to Use the Equitonic 9? No… it is ALWAYS safe to use for all horses, people, foals, and pregnant mares or stallions. No exceptions. It is just that gentle and powerful. The results will amaze you. How Long Would a Session Last and How Would I Use It? Many of our clients tell us they can see results in less than five minutes, especially if they are addressing stress or anxiety. Use the third setting, Restful, and place it on the chest. Most horses will lick their lips and drop their head around ninety seconds or sooner. Note: If you are sweeping (shown in guide) from head to tail, that may take two minutes. We have a client in Colorado that has had tremendous results with normal impaction colic using the sweeping method. Is There A Way To Attach The Equitonic To My Horse Besides Holding It In Place or Using Sweeping Motions? You can use duct tape to hold the unit in place and leave it on for hours. Some people place it in a white athletic sock and hang it over the stall door; the horses treat themselves. The owners have timed it. Depending on the horse, they will give themselves a twenty to thirty-minute session, moving their body every few minutes as they lean against the hanging sock. Additional Note: Sound Vitality is working on a blanket designed to hold the unit, but that will only cover the body. Duct tape works fine for hoof issues. So, What Do People Say About the Equitonic 9? “I purchased my Equitonic 9 about a month ago. I was actually my own first patient. I put it on my shoulder where I had been having pain for a year, slowly worsening. I put it on for 30 minutes on the ACUTE setting and to my astonishment, when I woke up in the morning, it was 90% better. Two more treatments and the pain is gone! At the ranch, I applied the treatment to a horse who had an infected shoe boil. I noticed a considerable increase in drainage right away which is highly desirable. Within a few days and several treatments, the boil drained and healed over. A few days later when I arrived, I was told that an old horse was down and wouldn’t get up, even when breakfast was delivered. Just then he struggled to his feet but wouldn’t eat. He was listless, head hanging down, eyes dull. Purchase an Equitonic 9 Today and Become a Member of the Sound Vitality Family! When buying an Equitonic 9, you’re not just purchasing a device. You’re becoming a member of the Sound Vitality family, and we are happy to help you in every way we can. We are a small company; our customers do NOT become a “number." We are always available to help with questions and we extend a 30-day money-back guarantee on all our products. At only $895, it is like having a workhorse to help you day or night— worth every penny! Call and order today!